Top ranked NSH (8-4) recorded its fourth loss in Jakarta on Sunday night. Hosts were edged by second ranked Pelita Jaya (7-4) 74-71. It ended at the same time the two-game winning streak of NSH. It may be a crucial game in the contest for the top position in the league. They outrebounded NSH 47-34 including a 36-13 advantage in defensive rebounds. The best player for the winners was the former international point guard Andakara Dhyaksa (173-92) who scored 22 points, 5 rebounds and 6 assists. American power forward Nate Barfield (206-88, college: Langston) chipped in 16 points and 11 rebounds. At the other side the best for losing team was point guard Andre Rorimpandey (177-96) who recorded 23 points, 8 assists and 4 steals. Both coaches used bench players in such tough game. Pelita Jaya have a solid series of three victories in a row. They maintain second place with 7-4 record behind leader Stapac. NSH at the other side still keeps top position with four games lost. Pelita Jaya are looking forward to face Siliwangi (#4) in Bandung in the next round. NSH will have a break next round. Very important is a road loss of second ranked Hang Tuah (5-6) against fourth ranked Satria Muda (5-6) on Sunday night. Visiting Hang Tuah was defeated by Satria Muda in Jakarta 77-59. It was a good game for American forward Dior Lowhorn (201-87, college: USF) who led his team to a victory with a double-double by scoring 25 points and 14 rebounds. Jamarr Johnson contributed with 19 points, 10 rebounds and 7 assists for the winners. American guard Gary Jacobs (188-92, college: Cent.Washington) answered with a double-double by scoring 17 points, 10 rebounds, 5 assists and 5 steals for Hang Tuah. Both coaches tested many bench players which allowed the starters a little rest for the next games. Defending champion moved-up to second place, which they share with Bima Perkasa and Hang Tuah. Satria Muda will have a break next round, and it should allow them to practice more before next game. Hang Tuah will play on the road against Siliwangi in Bandung and it may be a tough game between close rivals. Leader Stapac delivered the eleventh victory on Sunday night. This time they beat 5th ranked Prawira (3-8) 83-70 in Bandung. It was a great evening for Savon Goodman who led his team to a victory with a double-double by scoring 28 points and 18 rebounds. The best for the losing side was Dalarian Williams with a double-double by scoring 27 points and 15 rebounds. Both coaches allowed to play bench players saving starting five for next games. Stapac (11-1) have an impressive series of seven victories in a row. They maintain first place. Prawira lost third consecutive game. They keep the fifth position with eight games lost. Stapac will meet at home Pacific Caesar (#3) in the next round, which may be the game of the day. Prawira will have a break next round. In the last game of round 15 Satya Wacana defeated Siliwangi in Salatiga 75-71. We cannot really consider it an upset in the game between close teams in Bandung where 4th placed Siliwangi (4-7) was defeated by fifth ranked Satya Wacana (4-8) 75-71 on Sunday. The guests started the game with a very strong first quarter 23-8. But Siliwangi won third quarter 28-10. However it was not enough to take a lead and get a victory that evening. Satya Wacana made 20-of-24 free shots (83.3 percent) during the game. It was a great evening for American guard Madarious Gibbs (185-93, college: Texas Southern) who led his team to a victory scoring 41 points (!!! ), 7 rebounds and 7 assists. His fellow American import forward Raymond Miller (204-88, college: CS Fullerton) helped adding 16 points, 19 rebounds and 4 blocks. Satya Wacana's coach Efri Meldi used a ten-player rotation in such tough game. The best for the losing side was American forward Michael Vigilance (203-94, college: Clark Atlanta) with a double-double by scoring 32 points and 15 rebounds and Daniel Wenas (188-92) produced a double-double by scoring 12 points and 11 rebounds. Four Siliwangi players scored in double figures. Satya Wacana maintains fifth place with 4-8 record. Loser Siliwangi keeps the fourth position with seven games lost. Satya Wacana will meet at home higher ranked Bima Perkasa (#4) in the next round and it will be quite challenging to get another victory. Siliwangi will play against the league's second-placed Pelita Jaya and it may be a tough game between close rivals. Very important is a road loss of second ranked Hang Tuah (5-6) against fourth ranked Satria Muda (5-6) on Sunday night. Visiting Hang Tuah was defeated by Satria Muda in Jakarta 77-59. The game was mostly controlled by Satria Muda. Hang Tuah was better in third quarter 24-16. But it was not enough to take a lead and get a victory that evening. They outrebounded Hang Tuah 48-30 including a 37-22 advantage in defensive rebounds. It was a good game for American forward Dior Lowhorn (201-87, college: USF) who led his team to a victory with a double-double by scoring 25 points and 14 rebounds. International forward Jamarr Johnson (193-88, college: Widener) contributed with a double-double by scoring 19 points, 10 rebounds and 7 assists for the winners. American guard Gary Jacobs (188-92, college: Cent.Washington) answered with a double-double by scoring 17 points, 10 rebounds, 5 assists and 5 steals and the other American import forward Jarad Scott (203-95, college: Union, TN) added 20 points and 10 rebounds in the effort for Hang Tuah. Both coaches tested many bench players which allowed the starters a little rest for the next games. Defending champion moved-up to second place, which they share with Bima Perkasa and Hang Tuah. Satria Muda will have a break next round, and it should allow them to practice more before next game. Hang Tuah will play on the road against Siliwangi in Bandung and it may be a tough game between close rivals. Leader Stapac delivered the eleventh victory on Sunday night. This time they beat 5th ranked Prawira (3-8) 83-70 in Bandung. The game was mostly controlled by Stapac. Prawira managed to win second period 21-18. But it was not enough to take a lead and get a victory that evening. They outrebounded Prawira 49-28 including a 27-15 advantage in defensive rebounds. Stapac looked well-organized offensively handing out 26 assists. It was a great evening for American forward Savon Goodman (198, college: Shaw) who led his team to a victory with a double-double by scoring 28 points and 18 rebounds. International Kaleb Gemilang (183-91) helped adding 16 points and 6 rebounds. Four Stapac players scored in double figures. The best for the losing side was American Dalarian Williams (198, college: Life) with a double-double by scoring 27 points and 15 rebounds and the other American import guard Brachon Griffin (185-92, college: Elizabeth City, agency: SDJ Sports) scored 22 points, 6 rebounds and 6 assists. Both coaches allowed to play bench players saving starting five for next games. Stapac (11-1) have an impressive series of seven victories in a row. They maintain first place. Prawira lost third consecutive game. They keep the fifth position with eight games lost. Stapac will meet at home Pacific Caesar (#3) in the next round, which may be the game of the day. Prawira will have a break next round. 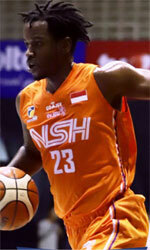 Top ranked NSH (8-4) recorded its fourth loss in Jakarta on Sunday night. Hosts were edged by second ranked Pelita Jaya (7-4) 74-71. It ended at the same time the two-game winning streak of NSH. It may be a crucial game in the contest for the top position in the league. They outrebounded NSH 47-34 including a 36-13 advantage in defensive rebounds. The best player for the winners was the former international point guard Andakara Dhyaksa (173-92) who scored 22 points, 5 rebounds and 6 assists. American power forward Nate Barfield (206-88, college: Langston) chipped in a double-double by scoring 16 points and 11 rebounds. At the other side the best for losing team was point guard Andre Rorimpandey (177-96) who recorded 23 points, 8 assists and 4 steals and American guard Dashaun Wiggins (188-91, college: Portland St.) added 15 points and 6 rebounds respectively. Both coaches used bench players in such tough game. Pelita Jaya have a solid series of three victories in a row. They maintain second place with 7-4 record behind leader Stapac. NSH at the other side still keeps top position with four games lost. Pelita Jaya are looking forward to face Siliwangi (#4) in Bandung in the next round. NSH will have a break next round.